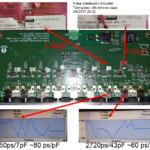 Despite length-matching traces between a distributor-stage and the individual output-stages on my pulse distribution amplifier there remains a 2-300 ps peak-to-peak output skew between the channels. Here's a test where a 50 pF or 10 pF trimmer-cap is added just before the input of the output-stage. 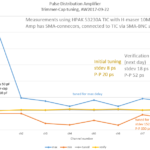 I found that tuning the cap results in a variable delay of 60-80 ps/pF, so if initially the channels are within 300 ps of each other the 500 ps tuning-range of the 10 pF trimmer-cap is sufficient. As a test I first tuned all channels to within 20 ps peak-to-peak, then verified this the following day and got 52 ps peak-to-peak. BNC-connectors might not be the greatest for picosecond level repeatability. trimmer-caps added to PDA2017.07 PCB. Tuning-range and tuned/verified propagation delays.